This film tells the story of King George VI of England, who sought treatment for stuttering from a therapist who was using a rather unorthodox approach for the time. This therapy became especially important when war with Germany broke out shortly after his ascension to the throne, necessitating radio broadcasts of speeches to the nation. Of course, I also have to point out that this film portrayed a couple of therapeutic uses of music. The use of singing was portrayed as one method for working through stuttering. We know that singing uses different neural pathways than speech, which is why a technique like melodic intonation therapy works for people who have lost verbal abilities due to strokes. Dancing to music to release inhibitions, increase fluency, and take the focus away from the stutter also played a part in this movie. I have not done any clinical work myself with people who have stutters, but I have heard that Colin Firth, who played King George VI, did a great job of portraying what it is like to have this particular problem. Listening to the discussion about stuttering and this movie on the call-in show Talk of the Nation is a great companion to this movie. 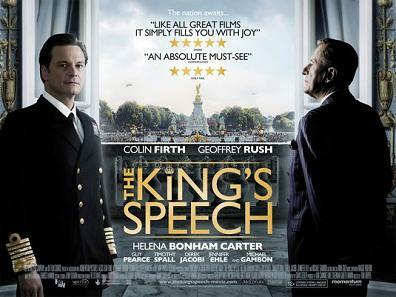 Have you seen “The King’s Speech?” What did you think? Many of my friends have been discussing this film, but I had not yet taken the time to watch the trailer and learn what it was about. What an intriguing film! I’m looking forward to watching it soon and looking for the things that you mentioned. Thanks for sharing, Rachelle! I hope you get to enjoy it, too!